Kaoru Mori rose to international fame as a manga artist with her first title Emma: A Victorian Romance. Since then, Mori has moved on from England to the Silk Road with A Bride's Story, but has kept the amazing attention to detail and wonderful characters that has brought her so much success. As a writer works, though, there will always be bits and bobs that never end up collected anywhere. 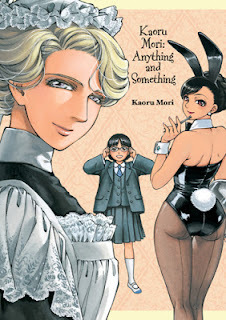 Kaoru Mori: Anything and Something gathers these side stories, introductions and one-panel pictures, interspersed with the author's signature self-depreciating wit. The first half of the collection consists of eight short stories that Mori has done for various publications. From a bunny girl at a gentleman's club to a middle-schooler getting her first pair of eyeglasses, to a wife finding a swimsuit bought years ago. The best part of these stories is that it shows the range Mori has. With her continuing series, she's exclusively written period pieces, set in the late 1800s and early 1900s. These are mainly modern-day stories, and show that Mori shouldn't be pigeonholed. In the middle there is a charming 'Middleword' manga explaining the short stories and where they were first published. It's always interesting to see an author reflect on her stories, and the context for these is appreciated. The second half of the book is a group of her shorter works. Interspersed between full page illustrations are small works she's done over the years. Here, we see everything from the signing pages that are handed out at large book signings to a manga of her reaction to watching the anime based on Emma: A Victorian Romance. Most of these pieces have some sort of annotation on the page, either giving the reader some idea of where they first appeared, or some note on her views of the piece. Perhaps some of her most detailed work can be found in the last three pieces, which are five-page studies on corsets, fireplaces and the servants of the Agatha Christie stories. Obviously labors of love, an amazing amount of information is squeezed into these pages. Fans of either of Mori's series will love the never-before-collected illustrations of their favorite characters included here. This has farther appeal, however, as a look into all of the promotional material that a manga artist produces over the years. In the afterward, she mentions that as she's been writing for ten years, this book is something of a milestone for her. Here's hoping that she does get that chance to keep writing, and I for one will be along for the ride. Highs: This book showcases the variety and detail of Mori's art, even when she's simply making advertising materials for a bookstore. Lows: As an American reader, rather than Japanese, I would have appreciated an explanation that "Fellows" and "Beam" were magazines in which her stories were published. Verdict: Not only for fans of her series, this is also recommended for fans of manga as a genre, for its look into the other materials that an artist produces. And you thought your college dorm-mate was bad.